Can I Turn My Lawnmower Into a Mulching Mower? Lawn mowers work to give you a great looking lawn by cutting your grass to a uniform length, but all that cut grass has to go somewhere. Side-discharge mowers allow the grass clippings to shoot out the side but can leave unsightly piles of clippings. Bagging your grass clippings can be inconvenient because you have to stop mowing to empty the bag. Instead, mulching mowers chop the grass clippings fine and insert them back into the lawn. You can convert many side-discharge and bag mowers into mulching mowers. Grasscycling is the process of allowing the grass clippings that result from mowing your lawn to remain on your lawn where they can decompose naturally. Grass clippings break down quickly, returning nutrients back into the soil. 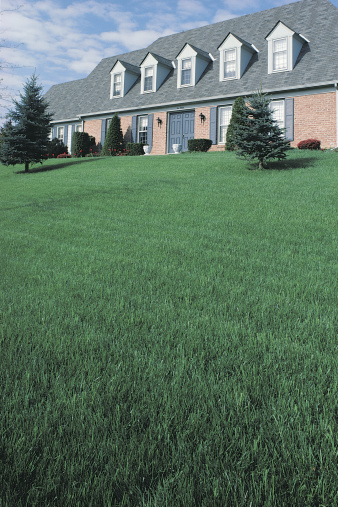 This process of grasscycling helps reduce your need to water and fertilize your lawn. It can also help reduce the amount of material added to solid waste dumps. A mulching mower allows you to easily recycle your grass this way. Grass clippings produced by conventional side-discharge mowers are typically larger in size than those produced by mulching mowers. Clippings from a side-discharge mower tend to accumulate in rows or patches. While this may be unattractive, it does not typically harm your lawn. Mulching mowers chop the grass clippings into much finer pieces, allowing them to settle into the grass without the clumps. The finer cut also helps the clippings to decompose more rapidly. Many side-discharge and bag lawnmowers, both gas-powered and electric, can be converted into mulching mowers by installing a mulching conversion kit. Mulching conversion kits typically include a mulching blade and a restriction plate, which prevents the grass clippings from being discharged through the side or rear chute. Mulching kits are not universal and must typically be purchased for your specific make and model of lawn mower. The Troy Bilt website recommends only installing a mulching kit on lawnmowers that have at least a 4-horsepower engine. With a cool engine and little to no gas in the tank, set the lawnmower onto its side. Use a socket wrench to loosen the bolt (tapping the wrench with a hammer to help loosen it if needed) on the regular blade. Once the bolt is removed, take off the blade and the blade support piece. Attach the mulching blade from the kit along with the blade support piece. Re-thread the bolt and tighten it again with the wrench. Mulching may not be appropriate for all situations. Grass that is exceptionally tall may cause mulching systems to bog down. Early spring grasses tend to have higher levels of moisture content, which can create a messy residue if mulched. The Irrigation & Green Industry website recommends cutting your grass with a conventional side-discharge or bag mower during the early part of the mowing season, and converting to a mulching system after the first few mowings.